AUGUSTA – Of all the wonders and joys that will come with winning the Masters, perhaps the best for Jordan Spieth will be telling his sister, Ellie. The golf world has marveled all week at Spieth's poise, his perspective, his whole persona, and a lot of that comes from being around Ellie, who is 14. She is a special-needs child, and her journey has served as a touchstone for her older brother's life. "She's the funniest member of our family," Jordan said. "It's humbling to see her and her friends and the struggles they go through each day that we take for granted – their kind of lack of patience or understanding, where it seems easy for us and it's not for them." When she came to see her brother play in person for the first time last week in Houston, Ellie kept asking Jordan after every round: "Did you win? Did you win?" And Jordan said, "Not yet." And then, "Not yet." And then finally, "No." "I can tell her I won now," he said Sunday with a grin. He won in a commanding, stunning, historic way: becoming the first player in Masters history to get to 19-under par before finishing at the same record 18-under par Tiger Woods posted in 1997. And while the statistics and numbers of his victory will be discussed for ages, the real victory is the one Ellie can feel. It's the blessing of seeing her brother happy. Spieth said he felt a rush of joy seeing his parents and brother waiting for him behind the 18th green – the first time they have seen him win a tournament as a professional – and when he was asked what the feeling might be like for Ellie watching on TV, he mentioned the excitement she would sense when she saw the family together. 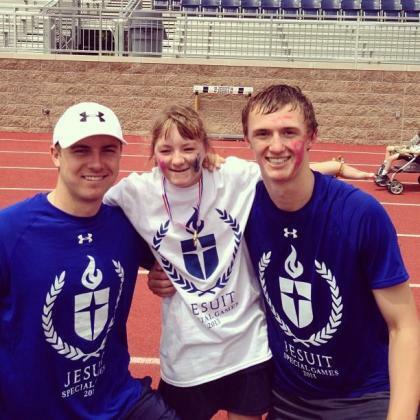 "Being Ellie's brother," Spieth wrote on his website, "humbles me every day of my life." It's not that Spieth doesn't care about running roughshod over the course and the competition. He texted caddie Michael Greller on Sunday morning and said he wanted to get to 20-under par. Considering, at that moment, no one had ever gotten to 19-under par, that was quite the aggressive plan. But behind that ambition is something else, perhaps best explained through another conversation Spieth had Sunday morning. His dad, Shawn, didn't say anything to his son before last year's final round, but this time he did. "This is the greatest game, the Masters," Shawn Spieth said. "But it's still a game." That's the perspective that Jordan Spieth seems to take with him everywhere. His younger brother Steven is not a golfer but a basketball player for Brown. Most of his closest friends don't play golf. Even Jordan himself grew up playing several sports. There's a bigger world out there, and Jordan understands it. Even caddie Michael Greller said Saturday that "at the end of the day, golf is just entertainment." And when Jordan got up to accept the green jacket, the moment every golfer cherishes as a distant ideal, he began by thanking the club members, the volunteers, and the food and beverage staff. He then called winning The Masters "the ultimate goal in my life" before correcting himself: "my golf life." So although Spieth reveres golf history, relying on Ben Crenshaw and caddie Carl Jackson to prepare him for this week's tournament, he is not a golf geek. He grew up doing much more than beating balls into nets endlessly like some fast-track kids. That, too, helped him this week. He said he relied chiefly on his imagination during the tournament, leaning on his ability to see arcs and curves and slopes. To many pros, the undulations of Augusta National serve as a house of horrors, keeping every setup from stability. Spieth loves that – loves the fact that every swing and putt is a little off-kilter. He sees the bigger picture even inside the tiniest frame. "He's got great feel and instincts," Grellar said Sunday. "Carl [Jackson] told me to trust our instincts, so I just tried to stay out of his way." Jordan Spieth, left with his sister Ellie and brother Steven. Perhaps what's most remarkable about Spieth's record performance at the Masters – he's the first wire-to-wire winner since 1976 – is that he's not an especially long hitter. He doesn't crush the ball like Rory McIlroy or Tiger or Dustin Johnson. He doesn't elicit gasps when he swings or chills when the ball rockets off his clubface. "I'll never hit it as far as [Rory] does," Spieth said. "I have to make it up someplace else." That someplace else was everywhere this week at Augusta. He was so brilliantly unspectacular that when he lined up his putt on the 12th green at Amen Corner on Sunday, fans were walking away by the dozen, moving to the next hole. That nook of the golf universe is known for its drama – literally named because of the need for divine help – and Spieth leaked that drama like a party balloon. He was basically a stealth supernova. His stealth days are over now. He will be on the monument of tour record-holders out by the 18th tee, with names like Woods, Mickelson, Nicklaus, Casper and Palmer. Woods' heretofore unthinkable 1997 tournament is now matched: Spieth has made the incomparable comparable. But all that is for the rest of us to ponder and debate. The real reward comes when Jordan Spieth sees his little sister and she asks him, "Did you win?" The answer will be yes, and the moment of triumph will truly be shared.